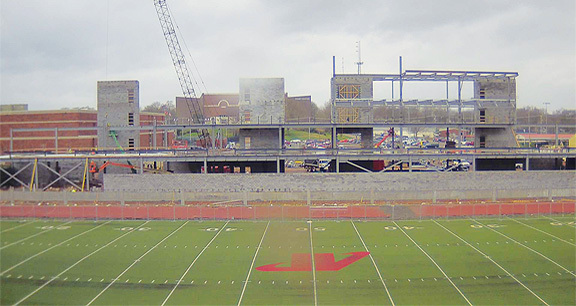 Project obstacles and solutions: Austin Peay University made plans to renovate its football stadium to include a state-of-the-art weight room, locker rooms, a player lounge and break out rooms, a new grandstand, club seating areas and skyboxes. Bell & Associates was hired as the general contractor to provide both preconstruction and construction management. The new structure includes a steel and concrete block construction with poured decks on the four levels. The engineering specs called for structural fiber in the concrete slabs in place of welded wire fabric. IMI added a 1.5 inch polypropylene fiber to the mix. In composite metal decks, compressive strength and flexural strength is at issue. By using a synthetic fiber in the concrete, time, safety and strength are all made possible. Time is saved when welded wire reinforcement is not needed, therefore eliminating the need to place it before the concrete is poured. Without wire fabric, there are less trips over the product, which produces a safer work environment. Since the fibers are mixed integrally throughout the concrete, it provides a more evenly distributed reinforcement. In all, IMI supplied 850 yards of fiber reinforced concrete for this project.